By the time you read this, I will have hopefully left San Francisco and arrived in New York City (just in time for 4th of July and Erlend's birthday weekend!) safe and sound. I don't dispense a lot of life advice, but I will say this: don't decide to move across the country during a holiday weekend. Just don't. Like almost all the recipes that have been on this blog in the last few weeks, this pie is a direct result of the leftovers in my San Francisco refrigerator. But it turns out cherries and blueberries are frequently used together in desserts as they come into season together. So no weird combinations like the pineapple, peach, and paprika pie I was trying to make happen last time — just summer berries in my favorite all-butter pie crust (wait — sincere question: is cherry actually a berry?). 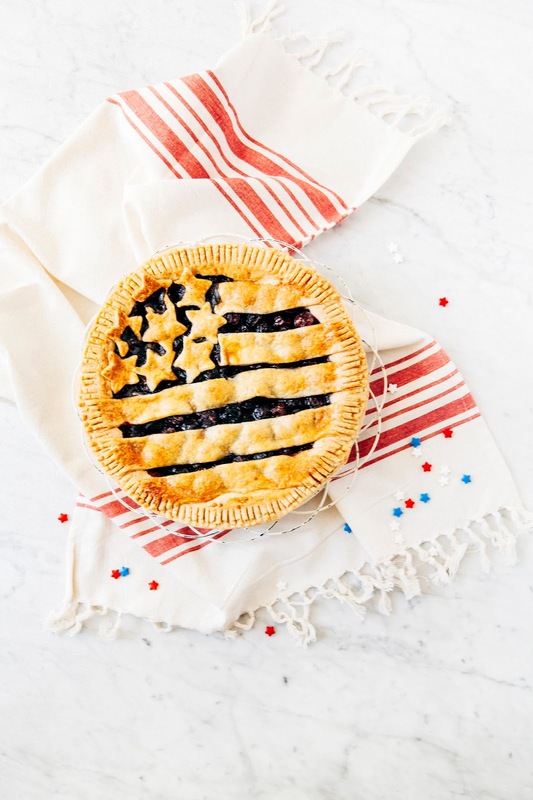 It's about the most classic American dessert I've ever made, and it's perfect for celebrating America's Independence Day. In case you need a visual on how to make build the American flag design, check out this awesome step-by-step tutorial! It also helps to have a pastry wheel (or a pizza wheel — let's be honest, they're basically the same thing) and ruler to ensure even stripes. The color contrast between the blueberries and cherries didn't turn out to be as vibrant as I'd hoped — turns out they bleed into the same color when baked. If you want more of a red and blue contrast, I recommend using strawberries instead of cherries! You can also always use food coloring or canned pie filling, but I might die a little bit if you do the latter. It's berry season; take advantage of it! Combine 1 cup ice, 1 cup very cold water, and 1/4 cup apple cider vinegar in a liquid measuring cup. Transfer the cup to the refrigerator and let the mixture chill while you work with the dry ingredients. In a large bowl, whisk together 2 1/2 cups all-purpose flour, 2 tablespoons granulated sugar, and 2 teaspoons kosher salt until combined. Add 1 cup cold butter cubes and use a pastry blender to cut the butter into the flour mixture, working quickly until mostly pea-sized pieces of butter remain (a few larger pieces are okay though — be careful not to overblend!). Remove your ice water mixture from the fridge and sprinkle 2 tablespoons of the ice water mixture over the flour mixture (from the 2nd step). 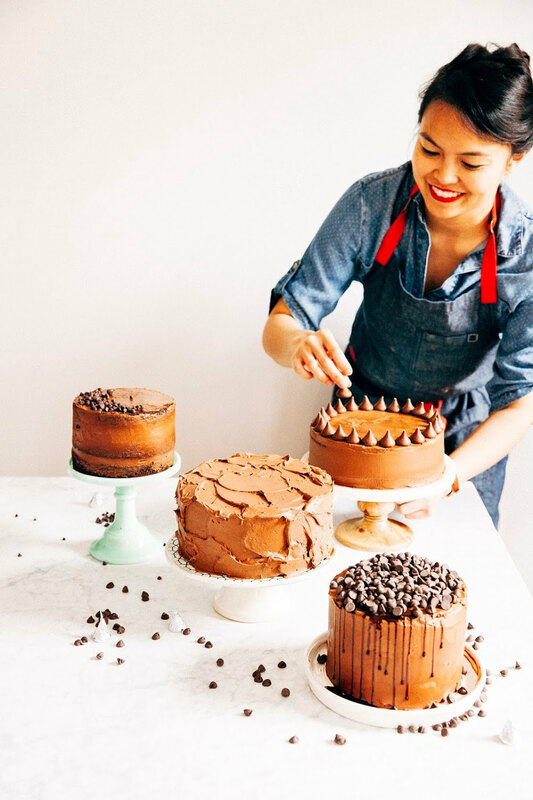 Use a pastry blender to cut the liquid into the mixture until it is fully incorporated. 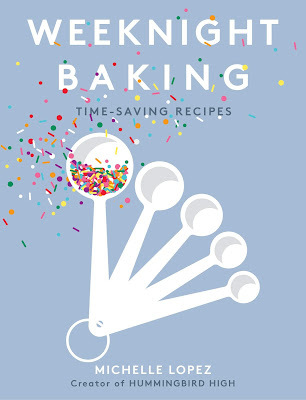 Add more of the ice water mixture, 1 to 2 tablespoons at a time, using the pastry blender to mix the liquid into the mixture until the dough comes together in a ball. At this point, it's okay if you have a couple dry bits remaining; you'll bring these together in the mixture later. Don't panic if you have quite a bit of the ice water mixture left — you likely won't need to use all of it (I use about half of it when I make my dough), and using all of it will lead to a soggy crust that's difficult to work with. Squeeze and pinch your fingertips to bring the dough together — if necessary, sprinkle dry bits with more small drops of the ice water to combine. Divide the dough into two balls and flatten both into a disk. Wrap in plastic, and refrigerate for at least 1 hour, preferably overnight. In a medium bowl, toss together 2 cups cherries, 1/2 cup granulated sugar, 3 tablespoons cornstarch, and a pinch of kosher salt until well combined. Set aside. In a small bowl, toss together 1 cup blueberries, 1/4 cup granulated sugar, 1 tablespoon cornstarch, and a pinch of kosher salt until well combined. Set aside. Once the dough has chilled overnight and has the texture and consistency of saltwater taffy, it's ready to be rolled. Liberally sprinkle a work surface with flour. Unwrap one of the dough disk and place it on the work surface, sprinkling its top with flour. If the dough is hard, let it rest for a few minutes. If the dough seems too sticky at first, add flour liberally. Use a rolling pin to roll with light pressure, from the center out, moving the pie dough around every quarter to roll it evenly. Roll the the dough to about 11 to 12 inches in diameter and about 1/4 inch thick (place your pie plate upside down over it to check its size). Move the dough into the pie plate by folding it into quarters, then moving it into the plate and unfolding it. When the dough is in the plate, press it firmly into the bottom and sides of the plate. Use kitchen shears to trim the excess dough. Next, arrange the fruit in the pie. 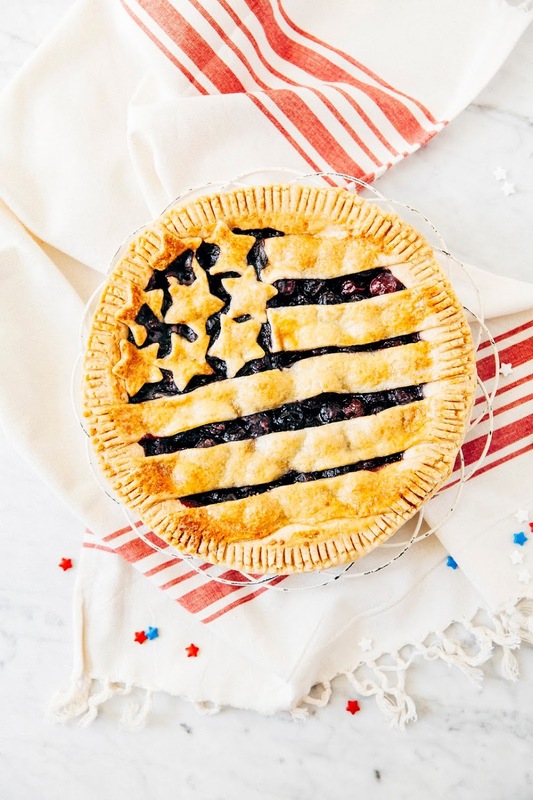 Take the blueberry filling and arrange the fruit so that they only take up a quarter of the pie — this will be the quarter of the pie that you will top with stars. Fill the remaining three-quarters of the pie with the cherry filling. Return to the refrigerator while you make the stars and stripes lid. Remove the second dough disk from the refrigerator and roll it out onto the floured surface into a circle about 11 to 12 inches in diameter. Use a pastry wheel or a sharp knife to cut out a quarter of the circle, similar to how you would cut a slice of pizza. 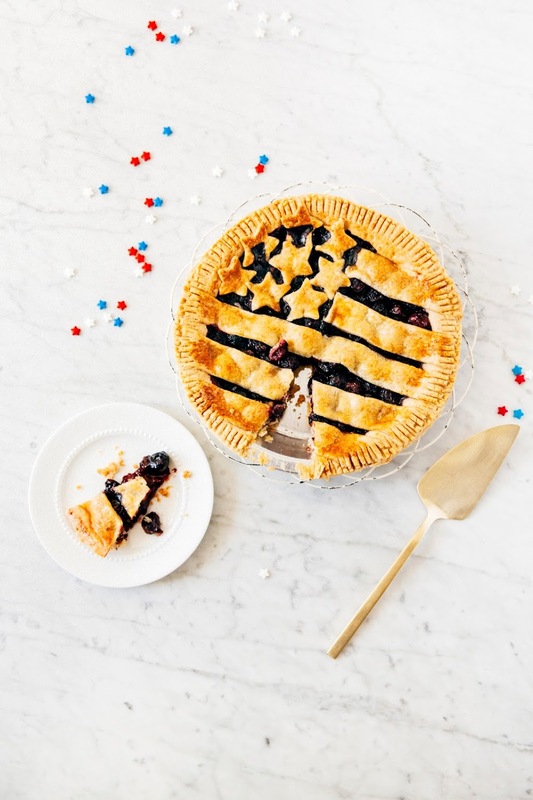 Use a star-shaped cookie cutter to stamp out stars and arrange them over the blueberry filling of the pie. Use the pastry wheel to cut the remaining three-quarters of the circle into even stripes (I used a ruler because I'm a nerd). 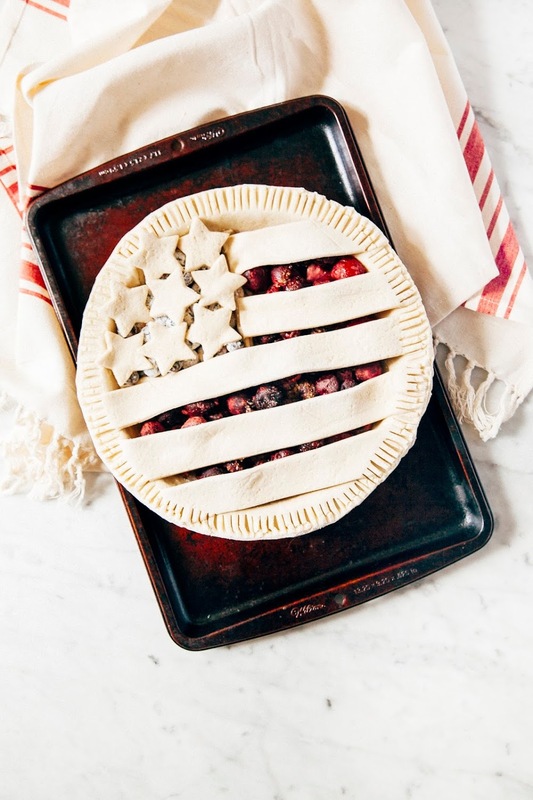 Arrange them over the cherry filling of the pie, lining the stripes accordingly with an American flag. Use a fork to crimp the stripes into the border of the pie. Transfer to the freezer to chill for an hour, preferably overnight. When the pie has frozen, it's ready for baking! Center a rack in the oven and preheat to 350 (F). Line a baking sheet with parchment paper and set aside. In a small bowl, whisk together 1 large egg and 1 teaspoon water to create an egg wash for the pie. 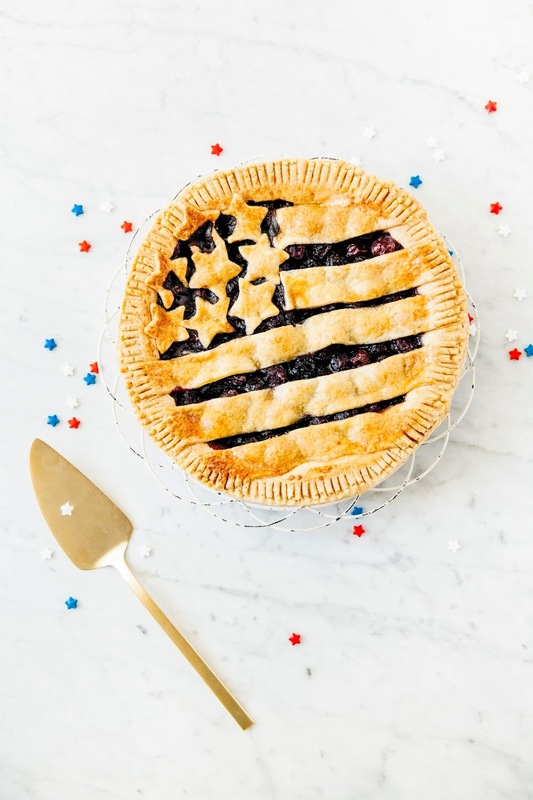 Use a pastry brush to brush the mixture over the stars and stripes portion of the pie, avoiding the filling and the pie edge. Sprinkle 2 tablespoons of demerara sugar evenly over the egg wash, and place the pie on the baking sheet. Bake in the preheated oven for at least 1 hour, or until the crust has turned golden and the fruit filling is juicy and bubbling. Transfer to a wire rack and allow to cool to room temperature before slicing. Enjoy!